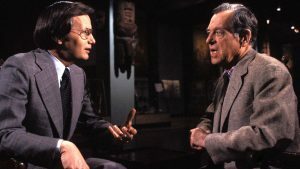 Recordings and TRANSCRIPTS of The Power of Myth, conducted by Bill Moyers and featuring Joseph Campbell, all recorded at George Lucas’ Skywalker Ranch for PBS. Read the article published by Moyers & Company, which contains all of the interview’s transcript, along with small clips of each episode! And if you want more of this amazing interview, go to the Joseph Campbell Foundation Youtube channel! to find many other clips and interesting interviews.